One of our favorite weeknight meals is to make pizza; invariably we take one of two pretty simple recipes and adapt it a little, based on what’s in the fridge. Tonight’s was based on this Triple Jump Pizza recipe. Normally -per the guidance from the other recipe- we slice up the prosciutto, and tonight we found out why. It may be easy to cut the whole pie into 8 slices, using the pizza wheel (Steve’s weapon of choice) or the butcher’s knife (mine). However, biting into it makes eating pizza an even more interactive experience. Not necessarily a bad one… just a potentially messy one. And, most likely we exceeded the healthy limits of cured meat volume. The flavor was definitely worth the cost of the experiment! 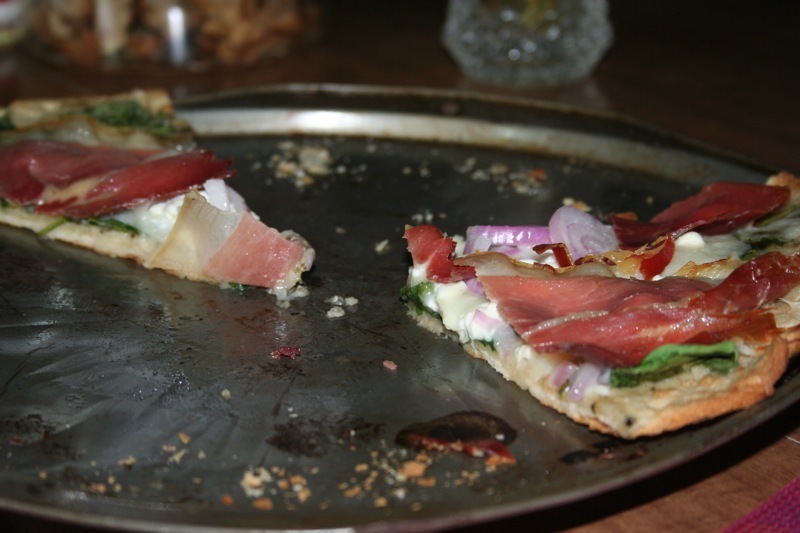 Tonight’s variation proved to be quite tasty; today’s notable substitution was the Mama Mary Thin and Crispy Crust (and, not burning it, this time). Thus far, in terms of crust, we’ve most liked the refrigerated pizza dough you can buy at Cossetta. Our favorite substitution (one we used tonight, as well) is a bottled artichoke-garlic bruschetta spread, in lieu of minced garlic.